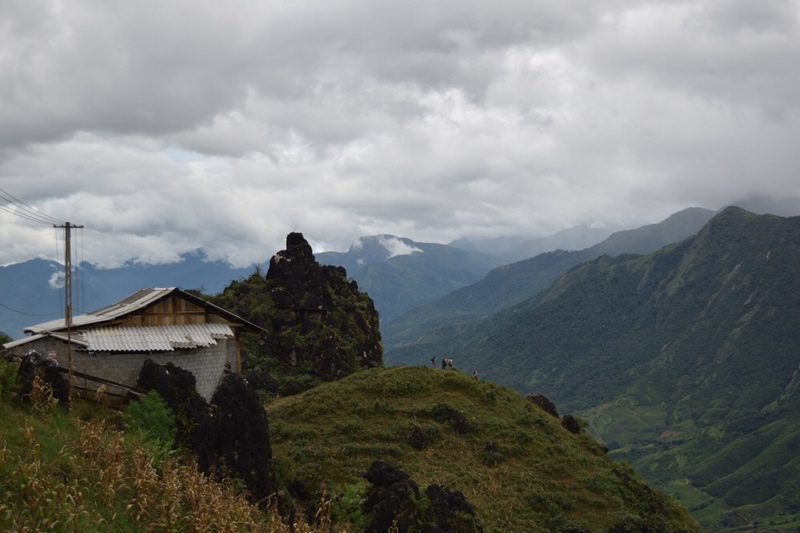 First stop: Sapa. 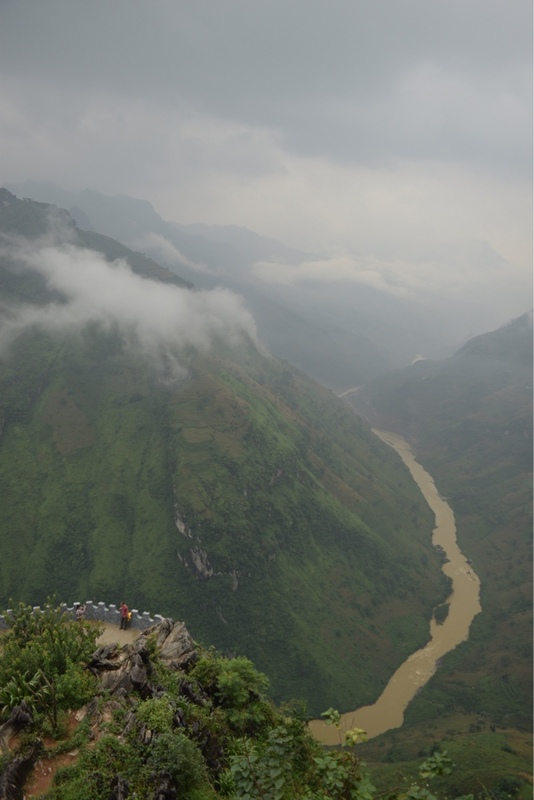 From the border with China, this well known trekking destination is only a day’s ride away, at the top of a very steep hill. We can proudly say we did actually ride there, accompanied by our new friend William (a very hairy cyclist from the UK who we’d acquired a few days earlier on the road). It was only 35km, but in the sweltering heat and humidity, the only way to do it safely was to set the alarm and be on the road by 6am, and even then we became so drenched in sweat that we could wring out our t-shirts to make puddles on the road. Gross. Getting into the town was exciting- after two months of pushing ourselves to get through China without much of a break, always staying in uninspiring towns with nothing to do but eat, sleep and move on, here we were presented with a picturesque, bustling place full of inviting cafes, bars, restaurants, shops and a stunning backdrop of the rice terrace valleys. It was also full of western tourists, which felt pretty weird after being pointed and stared at like aliens for so many months. Here, we decided, we were going to relax at last. It seemed we’d just unknowingly sold our souls to a hill tribe guide. 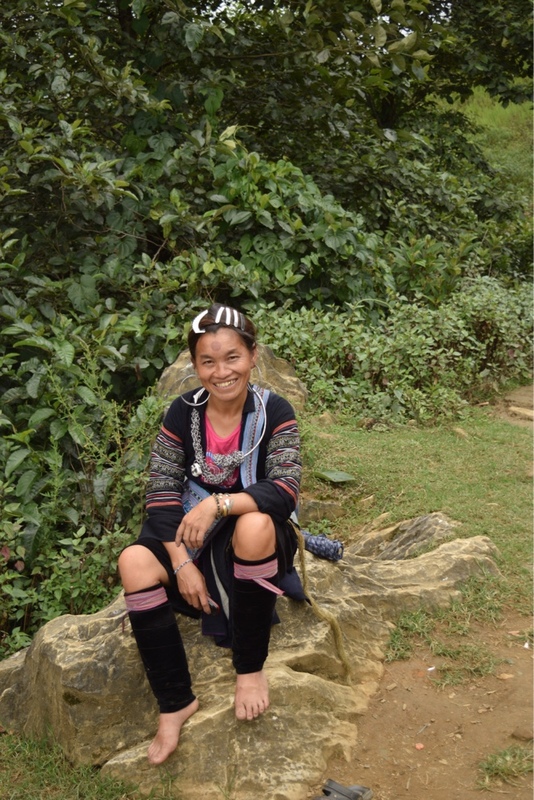 The Hmong women were everywhere in the town, trying to sell their wares. Whenever you politely refused, they would ask, “Maybe later?”, and if you made the mistake of nodding or smiling, a bracelet would be quickly tied around your wrist to seal the ‘promise’. Also, if you actually did fall for their charms and end up buying something, within moments you’d find yourself surrounded by women all looking sulky and grumpy, moaning at you in unison, “But why did you buy from her when you didn’t buy from meeeee? Now you bought from her you have to buy something from me too to make it fair ok?” It was pretty annoying, but it seemed to work on William, who must have bought a whole pannier bag full of hand crafts! The trek was beautiful though, and very peaceful. 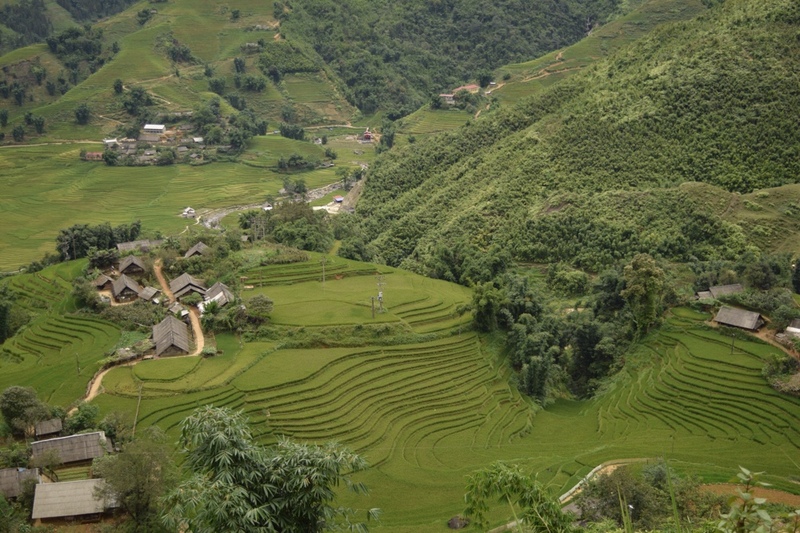 Our guide led us along quiet pathways in the hills, with fantastic views of the rice terrace valleys below. As we walked she explained to me how she makes her own clothes by twisting hemp into strands for weaving, and even makes her own indigo dye from the leaves that grow in the forest. 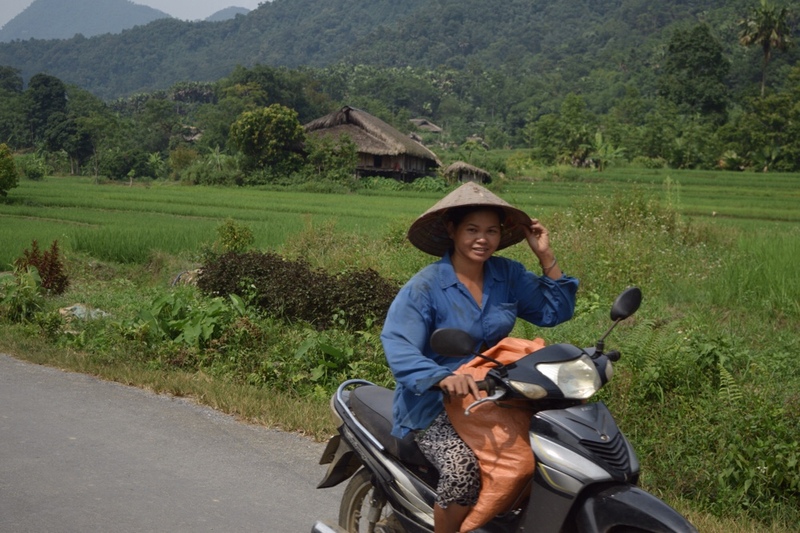 She also built her house of course, and gets her rice from the paddy fields surrounding it. 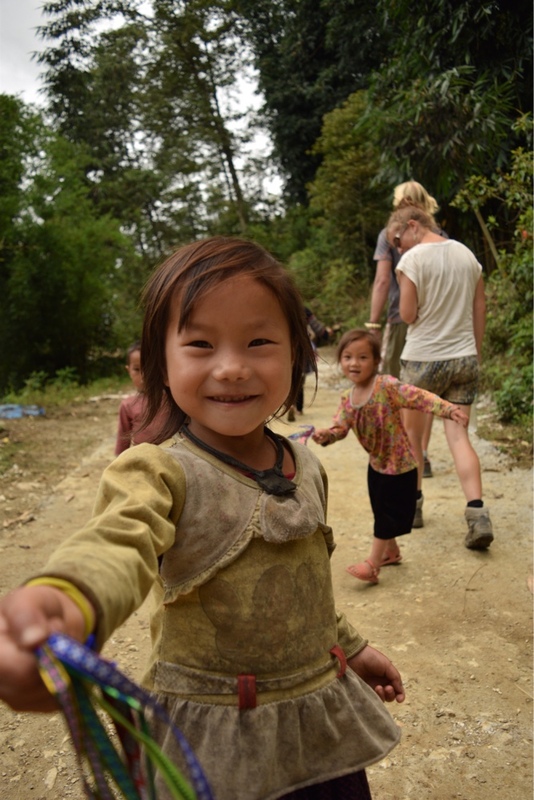 To go and visit her mum, whose village is in the next valley, she has to walk for a whole day over trails leading over the mountains. I couldn’t imagine a life further removed from what we consider ‘normal’. 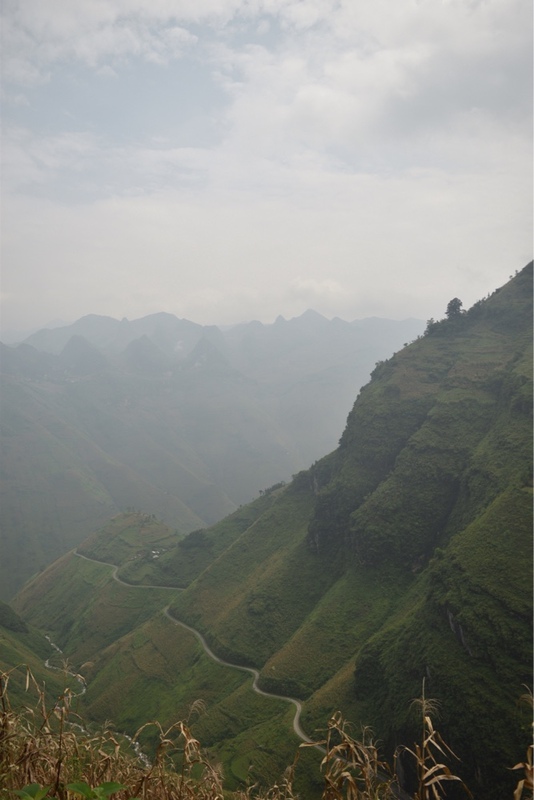 Next stop: Ha Giang province, in the far north. We’d read that this was considered the most beautiful province in the country, but the least visited due to the fact it’s pretty underdeveloped and you need your own transport to get around. What a perfect combination! 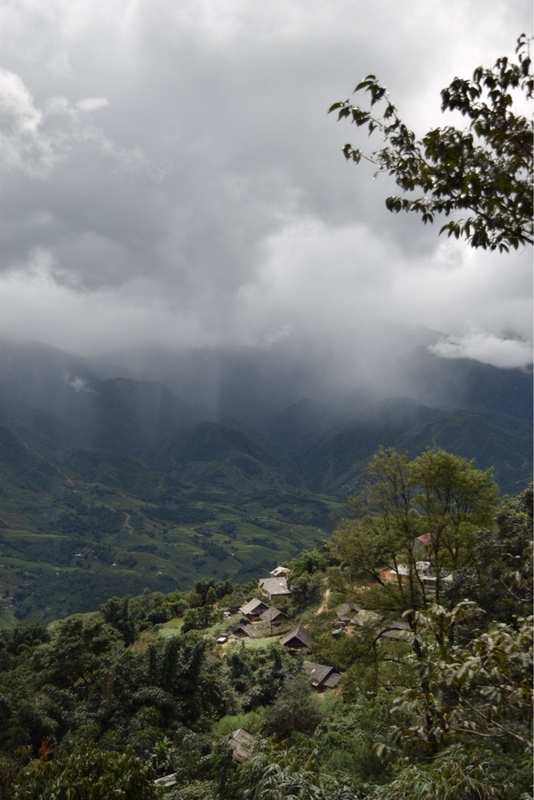 The ride from Sapa to Bac Ha however made us rethink our plan. Once again, we were up at sunrise, but this route was 100km with a crazily steep mountain right at the end, which we hit at the hottest part of the day. It was virtually impossible to get up there in the sun. We had to hide out for hours in the shade until gone 4pm, and then attempt the climb when it was getting marginally cooler. Even so, my head felt like it was going to explode as we pushed ourselves in our lowest gears- the gradient unforgiving for almost 20 kilometers, getting more and more dehydrated. We arrived after dark and as soon as we found a guest house, the owner realised I was close to fainting and quickly presented me with a chair and a glass of cold water. I was so exhausted I could hardly speak. Even having a shower was an effort. 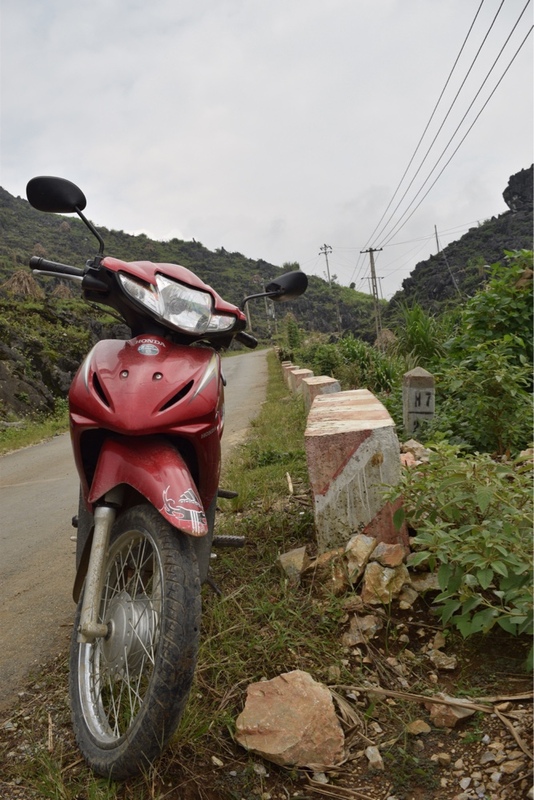 Leaving our tired bicycles to have a nice rest in Bac Ha, we nervously mounted this beast. 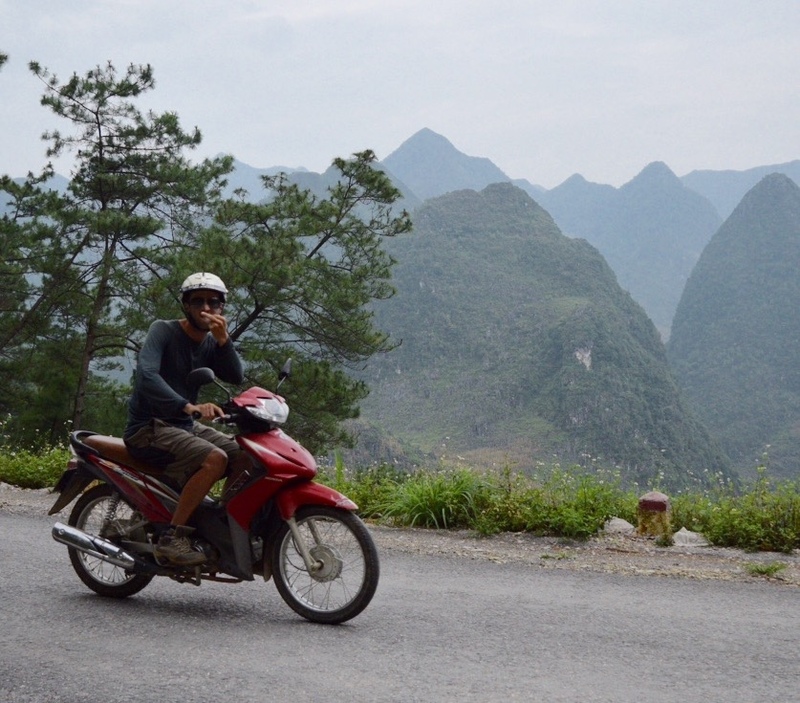 Joe quickly learnt the basics; I quickly learnt how to hold on and pray for my life, and together we sped off into the sunset towards Dong Van. It was completely thrilling. Anybody who has ridden a real motorbike would laugh and call us dweebs, but we felt like rock stars. It must be up there as one of the best feelings in the world- speeding along a mountain road with the wind in your face (incidentally, we’d found a way to keep cool! 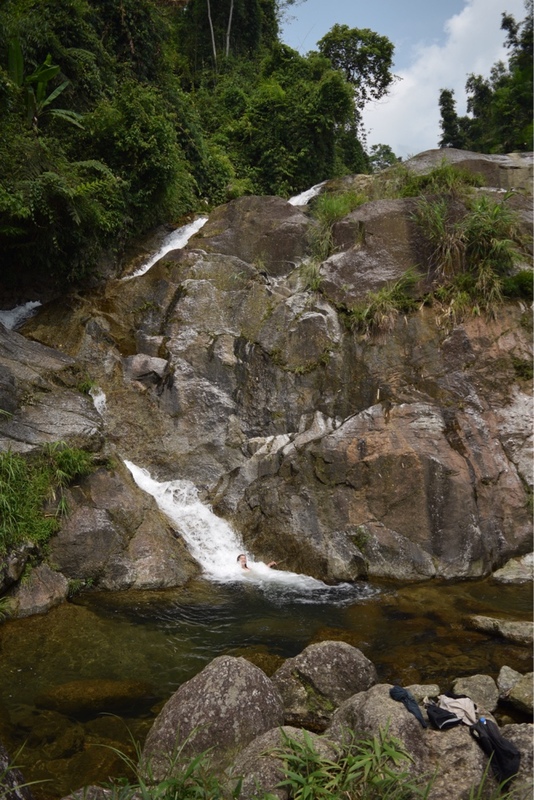 ), with jaw-dropping vistas on one side, and waterfalls on the other, knowing that you can spend all day exploring and taking as many detours as you like, because you’re not on a slow bicycle, killing yourself with exhaustion! Each time we got to the top of a pass of menacing switchbacks we’d laugh in disbelief at the fact it took us hardly any time or effort to get up there. 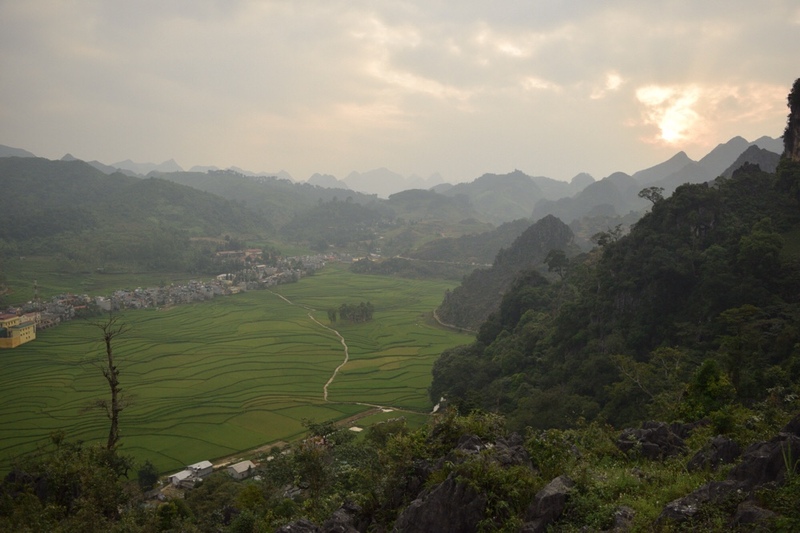 Our new temporary mode of transport allowed us to fully appreciate this astounding area of towering karst mountains, and we stopped all the time to take photos, swim in waterfalls, relax in hilltop forests, but mostly just to stare in amazement at the impressive work of nature around us. It was, for both of us, one of the highlights of the entire trip. Well wouldn’t that take a long time on a bicycle! Reunited again with our slow bikes, we decided it was time to get to Hanoi and then the coast. Now that we’re on the last leg of our trip, we’re suddenly very conscious about money and aware of how much time we can afford to spend in each country. We don’t want to waste time riding parts that aren’t so interesting, just to say that we’ve ridden all the way, because now we’re zig-zagging all over the place anyway, often going in the ‘wrong’ direction. We’d rather be able to make the most of our time in this part of the world where there is so much to see. With that in mind, we threw the bikes onto a sleeper bus to Hanoi (a bus with actual beds inside- I didn’t know they existed!). There’s not much I can really say about Hanoi other than that it has a lot of traffic (mostly motorbikes) and a lot of people. The old quarter has some nice architecture but you have to make sure you’re standing in a safe place before you can risk taking your eyes off the street to have a look. 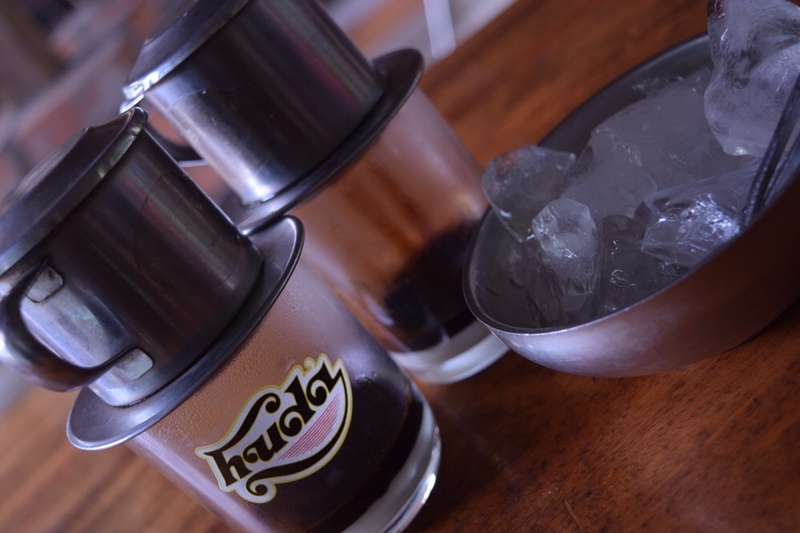 Lots of oversized, vest-wearing tourists squatting on miniature plastic chairs on the streets drinking the local ‘Bia Hoi’, loving the fact that it costs 15p a glass and trying to pretend it doesn’t taste like dishwater. We did stay with a really interesting Warm Showers host though, who told us stories about being in the city in its communist heyday in the 70’s, and the way that the rules have gradually been diluted over the decades to make way for the savage form of capitalism in place today (although it’s still officially a ‘socialist republic’ of course). Our host told us the ride to get to the coast wasn’t particularly pleasant, so once again we decided to cheat. 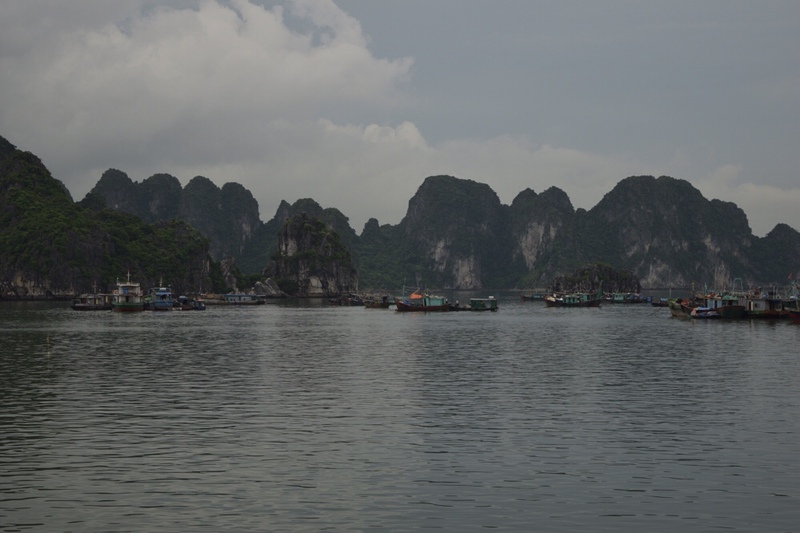 We took a train for a few hours to Haiphong, and then it was a two day ride up to the ferry port in Bai Tu Long Bay, where we could catch a boat to Quan Lan island. It was during this time that the strangeness began. Both evenings when we tried to find a guesthouse, we were met with cold blank stares from most of the owners, who quoted us prices way higher than usual (despite not being in the tourist areas) and refused to be haggled with even a little, preferring to make no money at all from us. Our smiles went noticeably unreturned and it felt awkward. Going out to get something to eat was even weirder, with more blank expressions- the owner of one cafe refused to acknowledge us whatsoever, preferring to call somebody else to come and serve us even when we were trying to put money in his hand to pay him. He didn’t once make eye contact. Were these coastal people all zombies? Or did they just hate us? Walking through the town after that freaky experience, I was kicked hard in the leg by a boy around ten years old. (Yes, physically assaulted as I walked down the street minding my own business)! I spun around and gave him a viscous telling off as his nasty little friends laughed and sneered as though it were normal behavior to kick people who look different to you. 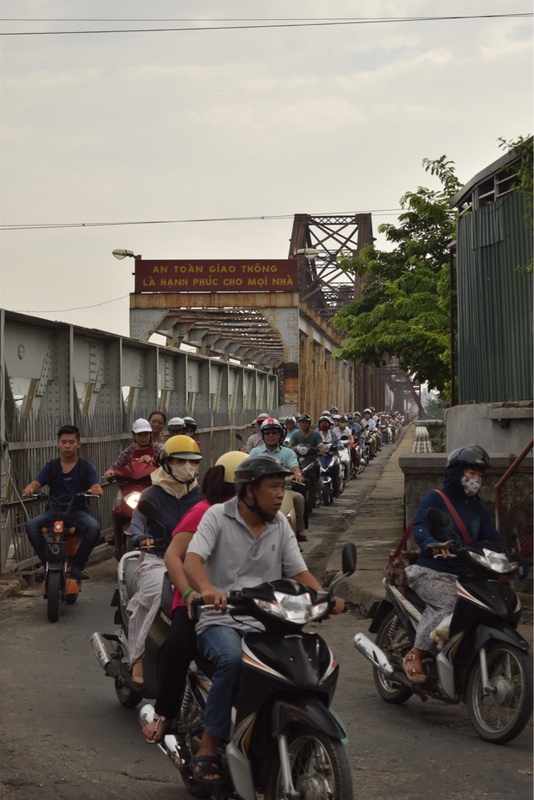 A lot of this took place in Halong city, just across the bridge from the touristy area at Ha Long Bay- probably Vietnam’s biggest tourist attraction! It was the same on the island (minus the kicking, thank god- that was a one off at least). Normally when we ride our bikes through quiet villages where they don’t see many foreigners, people wave and smile and shout hello to us all the time. Not here. All we got in response to our smiles were hostile scowls or blank, faraway looks. Add all this to the fact that we felt like people were constantly trying to rip us off and squeeze every penny out of us due to our western-ness and you can understand why we didn’t stay long there. (Even as Joe wobbled his way along the narrow, slippery gangplank of the ferry boat with his bike threatening to fall into the sea as he carried it, nobody offered to help him as they most certainly would have done in every other country we’ve been through so far. Instead, one man quoted him a small fee for a helping hand). We felt so unwelcome in this part of Vietnam that we decided to try our luck further down the coast. Was it because of the war? We were in an area that had been heavily bombed in the early 70’s, and many people will still undoubtedly have horrific memories from that time. Politics aside, if you lived in a village in Vietnam and ‘the West’ had dropped a bomb that killed a member of your family, your instincts towards western tourists only a few decades later wouldn’t instinctively be to welcome them with open arms. Another sleeping bus took us to the coastal town of Dong Hoi, and we hoped we weren’t offending anybody with our presence as we cautiously made our way through the streets. This was a more touristy area, so the hostel we found was friendly, and we celebrated Joe’s birthday with a huge breakfast of pancakes, fruit and milkshakes, followed by a swim in the sea. You could even say this hostel was too friendly- the girl in charge (a skinny goddess around eighteen in hot pants and a crop top) enjoyed spending her days lounging seductively on the sofa, tossing her long silky hair and pouting, draping her arms around all the male guests and telling anyone who’d listen that she wanted to find a British husband. Joe got a cheeky slap on the bum when I wasn’t around (and he was, naturally, disgusted by this…). It was even hotter here, and the only acceptable place to be was submerged in the sea. We reckoned the only way we’d be getting any cycling done would be if we hugged the coast heading south, throwing ourselves into the water every few hours to cool down. It sounded like a good plan, but first we had a quick detour to make. 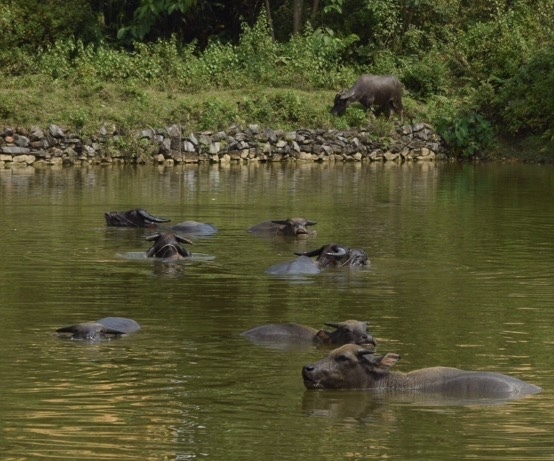 The Phong Na Ke Bang national park is only an hour inland (cough…on the bus that is…) from Dong Hoi, and had been recommended to me by a friend with almost fanatic praise, so we went to investigate. 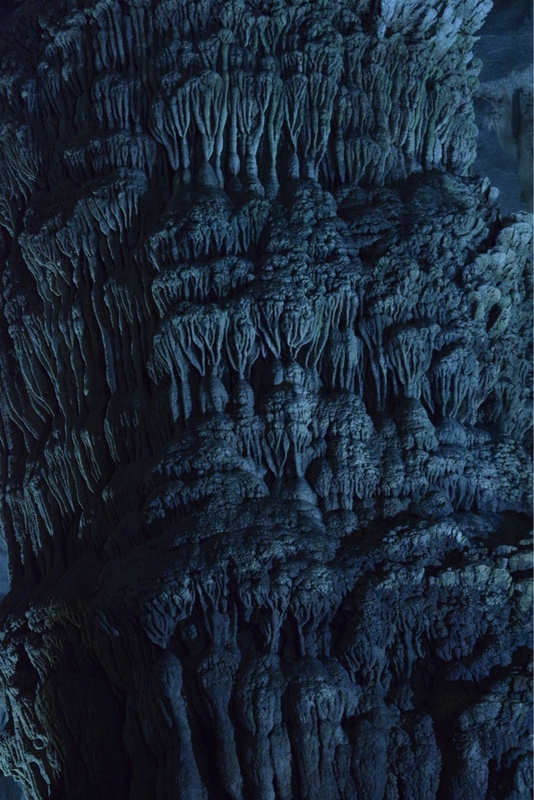 Here, Vietnam revealed another of her natural wonders. 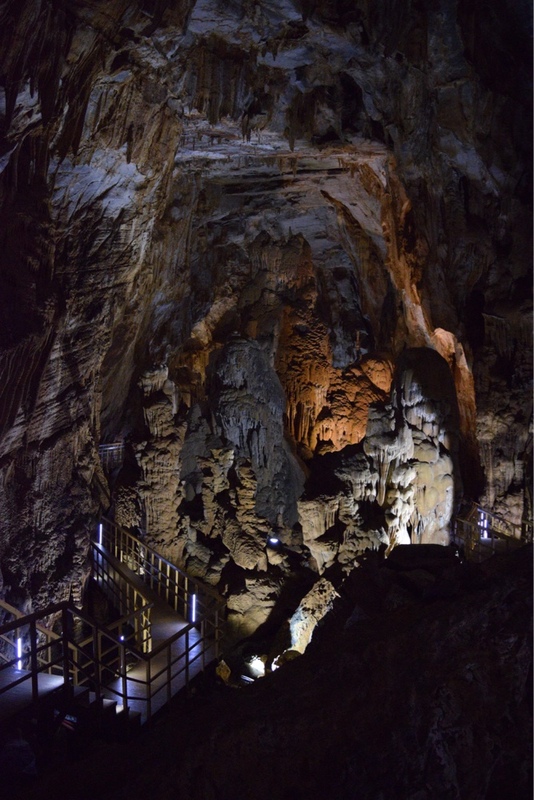 A dense forest and craggy mountains hide a number of gigantic limestone caves, some only discovered in the past decade, and includes the biggest known cave in the world, Son Doong. Our budget didn’t stretch to the $3,000 each needed to go on an excursion to the mother cave (which is so enormous that you could apparently fit a city inside it, complete with sky scrapers and jumbo jets flying overhead), or even to the popular touristy “Dark Cave”, which has to be accessed by zip line on a guided tour. 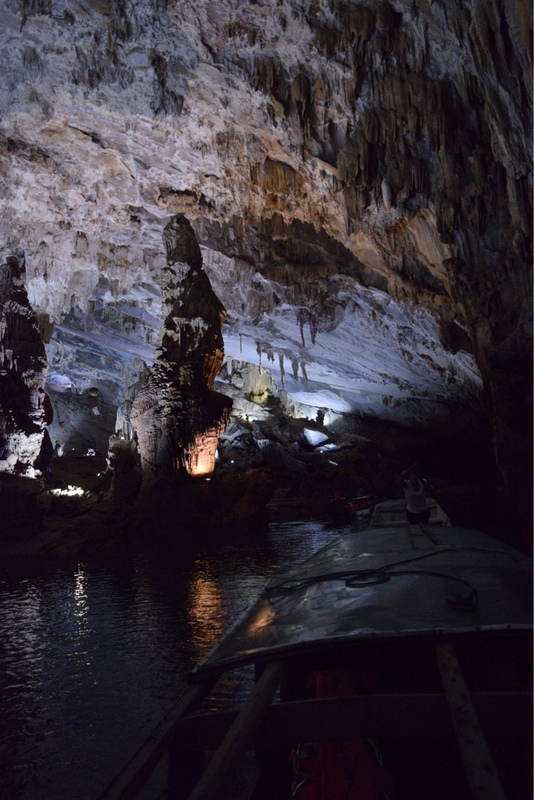 Instead, we rented a wooden boat from the village to take us to the Phong Na and Tien Son caves. Did dinosaurs ever sleep in here? One of the most astounding things either of us have ever seen. 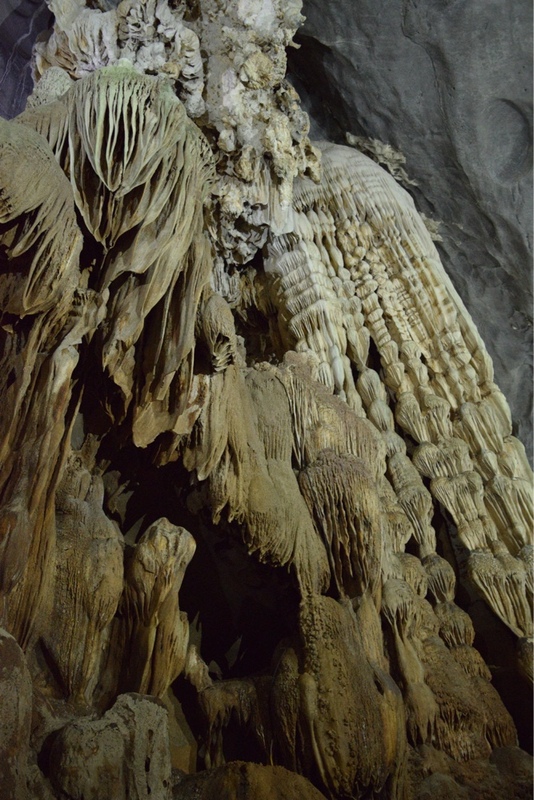 I think I’ve found my new religion- cave worshiping. You can laugh when I say this, but it was actually quite an emotional experience. It’s weeks later as I write this and I’m still in shock. Living our whole lives surrounded by human constructions, concrete, traffic and pollution, how humbling to walk in such an ancient place, intricately and beautifully designed by nature, and imagine its slow formation over millions of years. 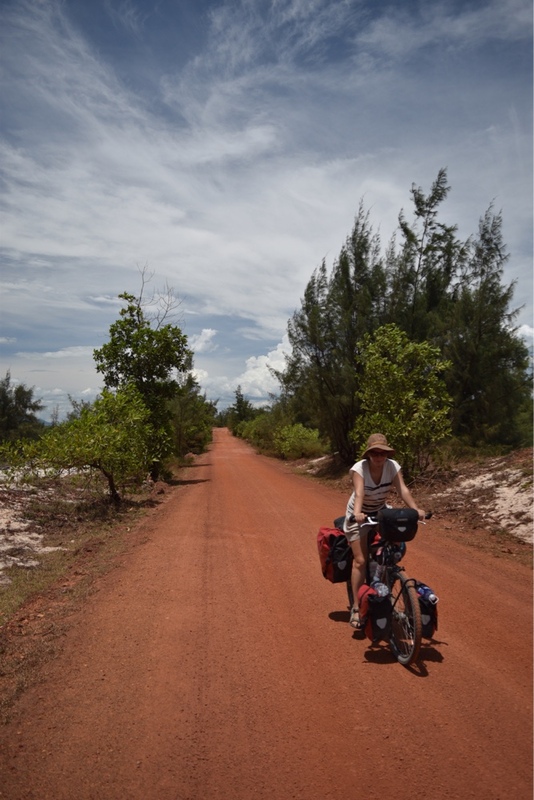 With our spirits high, we began our coastal riding along quiet tracks that led through sleepy fishing villages. 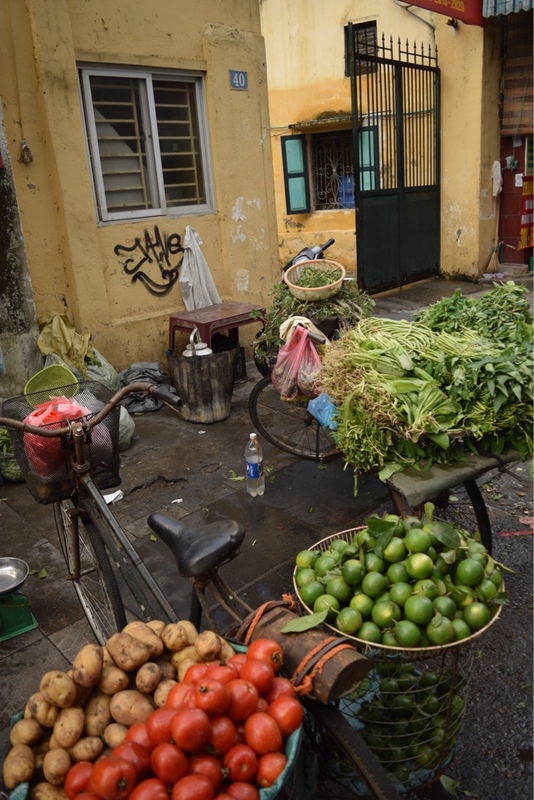 We were determined to do some successful cycling in Vietnam, to make up for all our indulgence in touristy places and get a feel for the ‘real’ country and people. Having the time off the bikes was wonderful, and we managed to see so many more places than would have been possible had we just been riding, but we hadn’t forgotten why we chose to do this trip on bikes in the first place. 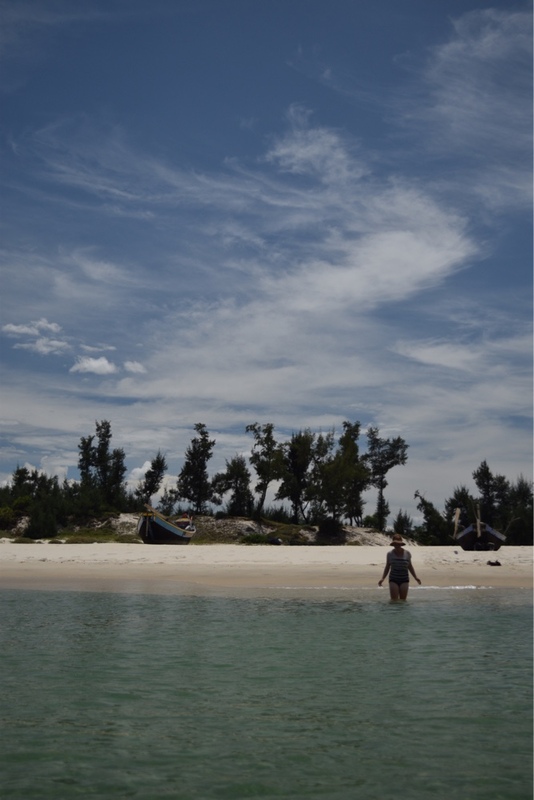 For a few days, we had access to our own stretch of paradise-like white sandy beach, dotted with fishing boats, continuing for as far as the eye could see. We tried sleeping in the inner part of the tent on the beach one night, but even that was disgustingly hot, so the next night we were ready to try out our hammocks. We didn’t get that far though, as we came across a group of young locals drinking beer on the beach when we were looking for the optimum clump of trees for a good hammock-pitch. They were extremely friendly, and invited us to sit with them and share their beer. Well this was a first for Vietnam. When we motioned that we planned to camp, one man told us to come and stay in his house and have something to eat. All of a sudden it felt just like old times in Central Asia again! We were quite excited, after having had so many negative experiences with the locals so far. ‘Go and have a swim’, he mimed, ‘and then we’ll go to my house’. So we went for a quick sunset swim, and came back to find that he’d disappeared! Instead there was a young woman beckoning us to follow her on her scooter. Ok, so it looked as though we were invited to her house instead. We followed her home, and she was all smiles, showing us where to take a shower etc. (God knows what happened to the man- maybe he was drunk and forgot about us as soon as we left his line of sight)! 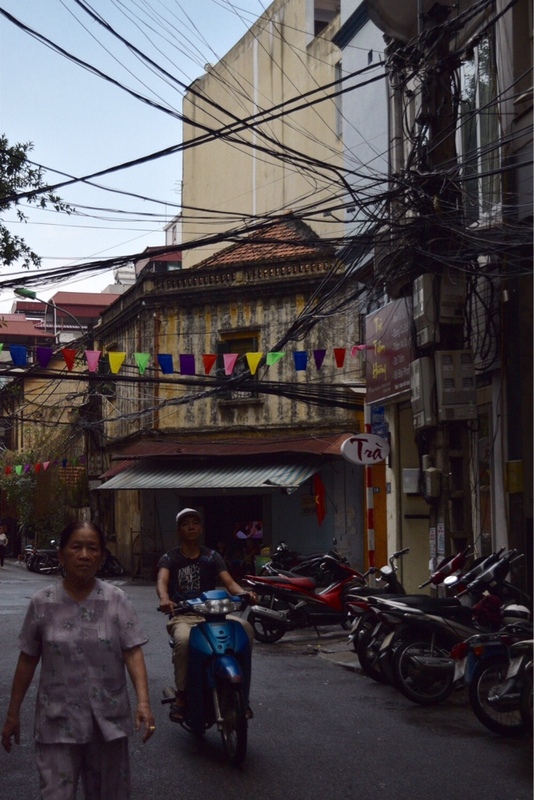 We were really looking forward to staying in a Vietnamese home. Then I began to notice that nobody else in the nice woman’s house seemed pleased to see us there. Rather than being amused and interested to discover two foreign strangers sitting in their home, as has always been the case before, the rest of her family stopped dead when they saw us, frowning. When I smiled and said hello, they looked away and spoke tersely with the woman. Ok, this experience had just swiftly gone from being welcoming to incredibly uncomfortable. Next thing we knew, the woman who’d invited us jumped on her scooter and drove off into the night, leaving us with a bunch of people who obviously didn’t want us in their house. An old lady appeared at this point and started rapping me on the shoulder to get up and come outside. She was pulling my bike out of the yard and trying to tell me something. ‘Oh, she wants to have a go on my bike?’ I thought. Well, this would break the ice. No, of course she didn’t want to have a go on my bike; she was evicting us. She briskly led us out into the darkness and down the track leading away from the house, where she then pointed into the night and shooed us away. We tried to explain that we’d been invited in by the young woman, but that didn’t seem to matter anymore. We asked where we should sleep, as now it was pitch dark and we were miles away from the nearest town, on sandy tracks in the forest. We had no idea how to get out. Without any form of smile or apology, she just pointed to the side of the track and motioned, ‘sleep there’. It was as though we were pigs. She wouldn’t even let Joe go back to the house to collect his latest ridiculous hat, blocking the way with her arms! It’s fair to say we made a scene at this point, around the same time the police appeared (they’d called the police?!) to show us the way to the town. We’d heard that it was illegal in Vietnam to host foreigners in your home, but we assumed it was one of those silly rules that nobody pays any attention to. Actually, it seems people are still in the habit of informing on their neighbors here and the mistrust of foreign devils is still high. The realisation that the local villagers would prefer to send us out into the dark at night rather than let us stay in a home we’d been invited to was deeply upsetting, and to be honest, it was the final straw. 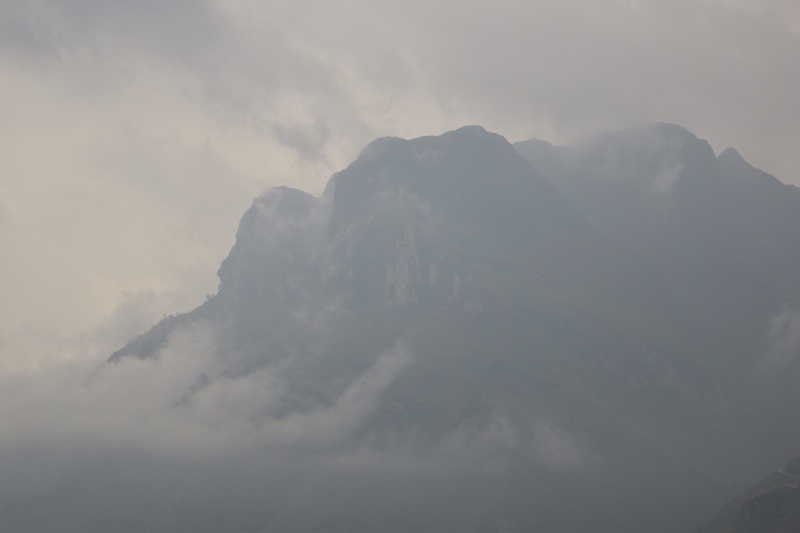 In Vietnam, we’d seen some of the most beautiful and memorable places of our whole trip- nature at its finest; but we’d also experienced the coldest, most unwelcoming and rude people. Of course, there were often lovely exchanges as well, but the frequency of our hostile experiences with locals was just so high that we couldn’t tolerate the idea of spending another day in such a confusing country where we didn’t feel welcome at all. Why should we continue to spend money in a country which treats its visitors with such little respect? We changed course the next morning and headed for the Laos border. Despite our mixed experiences, I’d still recommend Vietnam as a place to visit if you want to be amazed by nature. Maybe it’s safer to stay in touristy areas though, where people are paid to be nice to you! We’ve also heard that the south of the country is more friendly- I wouldn’t know. I can proudly say that we cycled all the way to the Laos border with no cheating, and have rediscovered our love for our bicycles. We promise to never neglect them in such a way again. 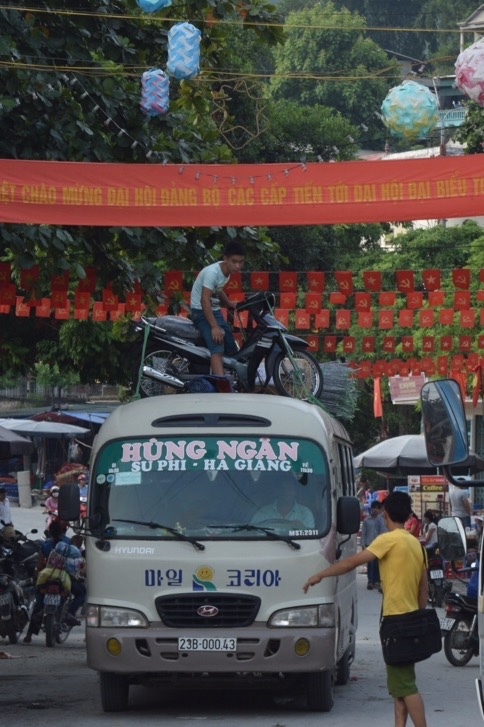 Anything can be put on top of a bus in Vietnam, even a motorbike with a man still riding it!